Baron Von Blaztnin. (3 evolutions in all). On its last evolution : Common. Pirates. Mage. Human. Spirit 2. Attack 4/7. Defense 2. Health points 15. 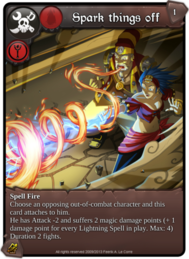 After each of your Fire Spells: The opposing character gains 2 “Powder” Token. 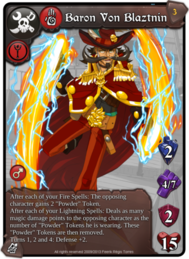 After each of your Lightning Spells: Deals as many magic damage points to the opposing character as the number of “Powder” Tokens he is wearing. These “Powder” Tokens are then removed. Turns 1, 2 and 4: Defense +2. Spark things off. Rare. Fire. Pirates. Mage. Choose an opposing out-of-combat character and this card attaches to him. He has Attack -2 and suffers 2 magic damage points (+ 1 damage point for every Lightning Spell in play. Max: 4) Duration 2 fights. Tetany. Uncommon. Lightning. Pirates. Mage. 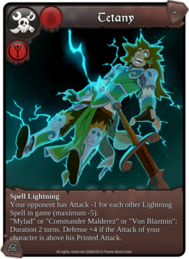 Your opponent has Attack -1 for each other Lightning Spell in game (maximum -5). “Mylad” or “Commander Malderez” or “Von Blaztnin”: Duration 2 turns. Defense +4 if the Attack of your character is above his Printed Attack.